Mumbai: Colonel Sanders has given KFC fans another reason to rejoice in the new year. Bringing the perfect combination of value, taste and variety, KFC India launched the Ultimate Savings Bucket with 16 pieces of your KFC favourites in one bucket priced at INR 599/- only. The digital film announcing the launch of the product aptly brings out the “Ultimate Excitement for the Ultimate Savings Bucket”. 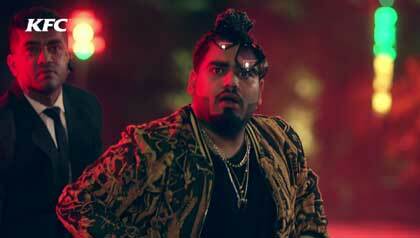 Conceptualized by Ogilvy India, the film opens with a luxury car and as the door opens, a stylish celebrity, perhaps a rapper, dressed in funky black and metallic gold steps out. Swaying to the music in full swagger, he looks towards the crowd that seems super excited to spot him as they rush towards him. But what we see next is truly shocking. The swarm of people rush right past him, towards something even more exciting and attention worthy – a large billboard that shows the Ultimate Savings Bucket. The next shot shows the awestruck rapper indulging in a piece of KFC’s golden fried chicken. To view the digital film, click here.